Our most popular magnifier fits over eyeglasses. Dial adjusting headband fits any size. 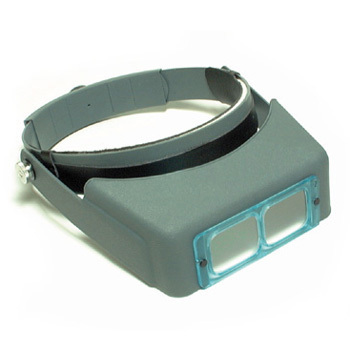 Well made magnifier made of light, durable material. Fits over eyeglasses. Adjustable pivot assembly on visor can be set to desired tension to stay in place when tilted. Lenses are ground, polished prismatic type for wide angle viewing. Available in six different magnifying powers.